Paper Piecing » What's Under the Needle? Daphne Greig is another teaching who has joined me at the Academy of Quilting. She will be presenting a number of classes with us, one of which starts next week - Paper Piecing Paradise. "a cottage in the woods on the edge of a stream, a clear sky so I can see the stars and a few woodland flowers and leaves. The geese stop by on their migratory routes too!" 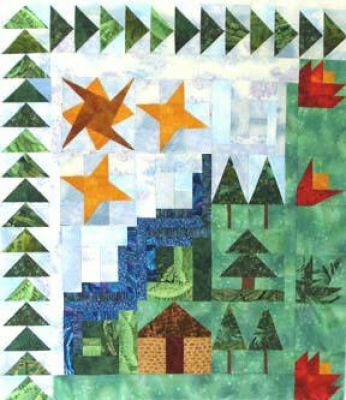 ... just like her quilt sample for this class. Can you put yourself inside this quilt image and feel like you are in paradise? Maybe you consider your paradise a little different. If so, Daphne will certainly help you rearrange the blocks to create your very own paradise or you can make it just the same as she has. Daphne will show you had to make your blocks perfect every time, no matter what the arrangement, and she'll also help you with fabric selection and creating the templates. What a fun class this will be!